JUEGOS DE MATEMÁTICAS: Game Achi. Tres en línea. The game is also known Achi three online simple and requires two players. Each player has three cards of different colors or distinguishable. Time is taken to start and put the tabs alternately one by one in the crossings of the lines. The first player to place three pieces in a row. 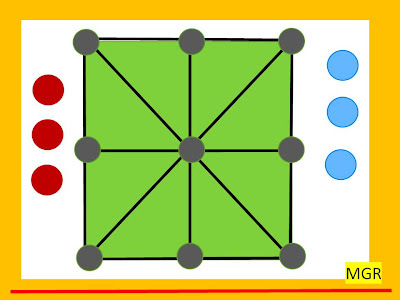 If the chips have been placed at the intersections of the lines and have not formed line for their turn move the chips in other circles that are adjacent or following empty without jumps, until a player gets three in a row. INVESTIGATE AND SEEK THE WINNING STRATEGY FOR THE FIRST PLAYER. Etiquetas: Game Achi. Tres en línea.